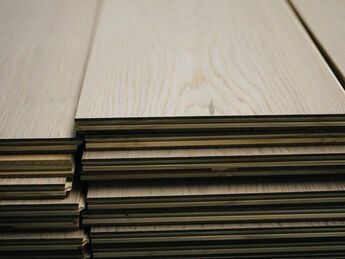 How do parquet surfaces differ? "mafi natural wood floors have exclusively an air-dried and oiled surface." Lacquered surfaces represent a classic sealing and are often obtained through several layers of lacquer. The wood underneath the lacquer layer is usually left untreated. Oiled surfaces, however, do not create a layer, but instead soak into the wood and provide the necessary robustness from the inside out. 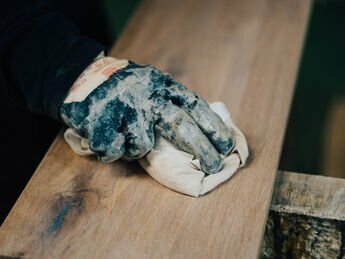 The advantages of an oiled surface are direct, pleasant contact with the wood, being able to simply repair the affected area without having to work on the whole surface, and also the positive room climate created by the exchange of moisture. We truly believe that oiled floors are more natural and more practical than lacquered floors. The reason for this is primarily the non-film-forming surface of the oiled parquet. UV oiled surfaces are somewhat misleading due to this naming. This is really an oil-based surface, but where a layer is also created. The applied oil is dried using UV radiation on the surface and thus forms a layer - similar to lacquered surfaces. The difference here is that we use an oxidative dried oil surface. The oil is applied equally to the wood, but then air dried which allows the oil to penetrate deep into the wood without closing the pores. This allows the wood to absorb greater amounts of water and also to release it back into the air. The results are a healthier room climate and easier cleaning. This wood surface is a lot easier for allergy sufferers and asthmatics. This is why mafi is also certified by the Australian Asthma Council.